COMPASS develops, or updates, a regional long-range transportation plan for Ada and Canyon Counties every four years. These plans look 20+ years into the future to help ensure our roads, bridges, and transportation services (buses, etc.) are ready by helping prioritize projects based on public input and how the region is likely to grow. The COMPASS Board of Directors adopted Communities in Motion 2040 as the new regional long-range transportation plan for Ada and Canyon Counties at its July 21, 2014, Board meeting. Communities in Motion 2040 plans to the year 2040 and replaces Communities in Motion 2035. The final plan, as adopted by the COMPASS Board, is here. The plan was developed between 2011 and 2014, with significant input from the public and the Communities in Motion 2040 Planning Team and Leadership Team. These two “teams” were formed specifically to guide the development of CIM 2040 and were comprised of members of the COMPASS Regional Transportation Advisory Committee and other stakeholders representing all eight of the planning elements addressed in the plan. While COMPASS is implementing CIM 2040, work on the update to CIM 2040 has also begun. The next update, CIM 2040 2.0, will retain a horizon year of 2040 and many of the basic tenets of CIM 2040. It is expected to be adopted by the COMPASS Board in 2018. For more information on Communities in Motion, contact Liisa Itkonen at (208) 475-2241. Previous long-range transportation plans for the Treasure Valley can be found in the archives. From September 2011 through October 2012, COMPASS, its member agencies, and hundreds of stakeholders undertook a process to develop a "preferred growth scenario" ― a realistic vision of what Treasure Valley residents want the valley to look like in the year 2040. This scenario – the Communities in Motion 2040 Vision – was approved by the COMPASS Board in October 2012. The CIM 2040 Vision broadly describes where future households and businesses will be located in Ada and Canyon Counties in the year 2040, taking into account projected growth in population and jobs, citizen input, and existing comprehensive plans. The development of the vision set the stage for planning a fiscally constrained transportation system to serve the needs of the Treasure Valley. Learn more about the CIM 2040 Vision, the visioning process, and growth allocations. View CIM 2040 Vision map. The COMPASS Board of Directors adopted Communities in Motion 2040 as the new regional long-range transportation plan for Ada and Canyon Counties at its July 21, 2014, Board meeting. Communities in Motion 2040 plans to the year 2040 and replaces Communities in Motion 2035. The final plan, as adopted by the COMPASS Board, is linked below. Chapter 6 contains a list of 33 unfunded priority corridors and projects. Each of these are summarized below. The summaries are “living” documents, which will be updated as new information becomes available. On February 26, 2018, the COMPASS Board of Directors updated the order of the list of unfunded priority corridors and projects. The list below reflects the updated priority order. 1. Interstate 84 (Centennial Way Interchange to Franklin Boulevard Interchange) Update! Partially funded; widening from Karcher Road (Midland Boulevard) interchange to Franklin Boulevard Interchange approved for funding, environmental study from the City of Caldwell to Karcher Road (Midland Boulevard) Interchange approved for funding, and capacity and safety improvements from the City of Caldwell to the Karcher Road (Midland Boulevard) Interchange approved for funding. 2. State Highway 44/State Street High Capacity Corridor Update! Partially funded; widening from Star Road to State Highway 16 approved for funding. 3. US Highway 20/26 (Chinden Boulevard) (Middleton Road to Locust Grove Road) Update! Partially funded; widening from Star Road to Locust Grove Road approved for funding. 4. State Highway 55 (Snake River to the City of Nampa) Update! Funding for an environmental study to widen State Highway 55 from Pride Lane to Middleton Road approved for funding. 5. State Highway 16 / McDermott Road (Kuna-Mora Road to Ada/Gem County Line) Update! Partially funded; preliminary engineering work on the extension of State Highway 16 from Interstate 84 to US 20/26 (Chinden Boulevard) approved for funding. 6. Regional park and ride lots (near-term improvements) Update! Partially funded; park and ride lot in the City of Middleton approved for funding. 12. valleyconnect near-term (capital/operating) Update! Partially funded; preliminary design and engineering work on a transit oriented development in the City of Nampa approved for funding. 23. State Highway 55/Midland Boulevard Bottleneck (in City of Nampa).Update! This project has been approved for funding. Long-range transportation plans, such as CIM 2040, must be fiscally constrained, meaning they can only plan for projects that can realistically be accomplished with identified funding. These projects are included on lists of “funded” projects within CIM 2040. However, project needs significantly exceed the funding identified in CIM 2040. Therefore, 33 needed but unfunded projects were prioritized and identified in CIM 2040, to be funded if and when additional funding became available. Funding has become available to address some of these unfunded needs; CIM 2040 has been amended to show these projects as “funded.” Details of these amendments are below, as are public comments received on the proposed amendments. Amendment #1: Communities in Motion 2040 was amended on June 20, 2016, to add a project to modify the I-84/Karcher Road interchange and provide a second southbound through-lane on Midland Boulevard. This project was #23 on the prioritized list of unfunded projects in Communities in Motion 2040 (see above). This amendment moves that project from the "unfunded" list to the "funded" list within Communities in Motion 2040. Amendment #2: Communities in Motion 2040 was amended on June 19, 2017, to add a project to widen Interstate 84 between the Karcher Road (Midland Boulevard) interchange and the Franklin Boulevard interchange in Nampa. This project addresses the eastern portion of the #1 unfunded priority in Communities in Motion 2040 (see above). This amendment moves the eastern portion of that project from the "unfunded" list to the "funded" list within Communities in Motion 2040; the remaining (western) portion of the project, from western Caldwell to the Karcher Road (Midland Boulevard) interchange will remain as the region’s #1 unfunded priority. Amendment #3: Communities in Motion 2040 was amended on September 12, 2017, to add an environmental study on Interstate 84 from Caldwell to the Karcher Road (Midland Boulevard) interchange in Nampa. This required study will help prepare this portion of I-84 (unfunded priority #1) for eventual widening; however, construction remains unfunded. Amendment #4: Communities in Motion 2040 was amended on October 16, 2017, to add, remove, and change the scope of several funded projects in CIM 2040. Full details of the changes can be found at the end of the resolution, below. Amendment #5: Communities in Motion 2040 was amended on February 26, 2018, to add projects to add capacity and safety improvements on Interstate-84 from the City of Caldwell to the Karcher Interchange in the City of Nampa, begin preliminary engineering on the extension of State Highway 16 from Interstate 84 to US 20/26 (Chinden Boulevard), and begin design and environmental work on a transit oriented development in the City of Nampa. Each of these projects comprise portions of unfunded priorities identified in Communities in Motion 2040 (see above). Amendment #6: Communities in Motion 2040 was amended on October 15, 2018, to add an environmental study on State Highway 55 from Pride Lane to Middleton Road in Canyon County. This required study will help prepare this roadway (unfunded priority #4) for eventual widening. Public participation is a key component of the planning process. CIM 2040 will help shape how the Treasure Valley – your home – will grow. It’s important that the people who live here and whose lives will be affected by what’s in the plan be a part of developing it. COMPASS has developed a public involvement plan that will guide how we work with you to ensure everyone has a chance to be heard and involved. The COMPASS Board approved the CIM 2040 public involvement plan on October 17, 2011. Link to that plan here. Your Treasure Valley Future: Photo Challenge! From December 2012 through November 2013, COMPASS asked residents what they want the Treasure Valley to look like in the future. COMPASS asked photographers of all abilities to share photos that show values, ideals, and things in Ada and Canyon Counties that people would like to see carried into the year 2040 or changed for the better. Thank you to everyone who took the time to submit a photo and tell us what you think about your Treasure Valley. COMPASS received 55 photographs depicting all types of ideas and ideals to carry forward to continue to make the Treasure Valley an incredible place to live, work, and play. You can view the photos on the COMPASS website and on the COMPASS Facebook page. We’ll also use the photos to illustrate Communities in Motion 2040, as well as other related outreach materials and documents. Be watching for them! Today’s youth will be adults –commuters, home owners, tax payers – in 2040. To help get them thinking about their future, COMPASS has been asking local youth what they think the future of the Treasure Valley will look like. Junior and senior high school students in Ada and Canyon Counties were invited to imagine the Treasure Valley in the year 2040, then create videos to share their vision for the future. Vera Gaddi and Sarah Dean submitted the winning video: 2040: A Sneak Peek into the Future. Congratulations! 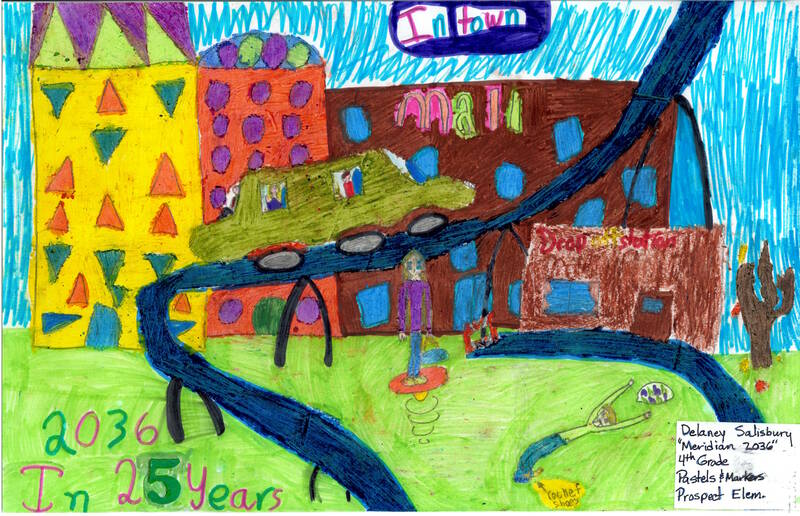 In fall 2011, elementary aged children in Ada and Canyon Counties were asked to draw what they think their community will look like in 25 years. 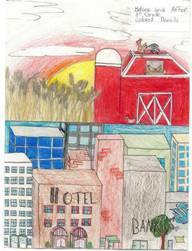 We had many creative entries; see first place winners below and click here to view all the winning entries. 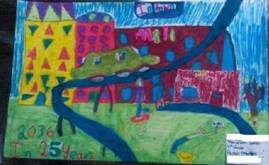 Also watch for the artwork displayed at the COMPASS office, on ValleyRide buses, and at COMPASS events. This update of Communities in Motion will plan to the year 2040. Looking nearly 30 years into the future can seem overwhelming and, given the volatility of our current economy, it may be hard to concentrate on anything beyond tomorrow and what it may bring. However, long-range planning, and your involvement in it, helps steer the future of our valley. Each quarter we’ll highlight a reason why COMPASS thinks you should care – ways that this plan will affect you. These will be listed below; hover over each “reason” and the full text will pop up. However, we’d also like to hear from you – why do you care or why do you think others should care? Email aluft@compassidaho.org to share why you care. Each quarter we’ll compile the reasons we receive and post them on the COMPASS blog; we may even use your reason in our quarterly list below. Reason #1: How about 7.6 billion reasons? It is projected that $6.2 billion will be spent on roadways and $1.4 billion will be spent on transit (public transportation) in Ada and Canyon Counties between 2010 and 2035 - even more as we plan out to 2040. Unbelievable as it may sound, that funding is far short of what is projected to be needed to keep up with population growth. That money comes from you - be involved to have a say in how it is used. Reason #2: CIM 2040 can help you keep your New Year's resolutions. Want to get in shape? CIM 2040 will look at ways to increase walking and biking facilities and opportunities. Want to save money? Housing and transportation aspects of the plan will examine the true cost of housing, once transportation costs are factored in. Want to spend more time with family and friends? CIM 2040 will include options to reduce road congestion, from signal timing to transit to options for walking and biking, which can lead to less time on the road. Reason #3: Communities in Motion 2040 will impact your children’s future…and yours too. COMPASS has been reaching out to youth as part of the Communities in Motion 2040 planning process, as they are the ones who will be the adults when the plan reaches its horizon year of 2040. However, youth are not the only ones who will be impacted. COMPASS will begin implementing Communities in Motion 2040 as soon as it is adopted by the COMPASS Board - in 2014. So, whether you are young or old, thinking long-term or short-term, there are elements in the plan that have the potential to affect you. The plan will influence where new houses are built, where new jobs will be located, and how and where we all commute - today and tomorrow. Reason #4: We can control our own destiny. We can control our own destiny instead of waiting for destiny to control us. Planning for the future as we (you!) want it to be allows public agencies to set goals, adopt policies, and develop programs and infrastructure to help realize that future. We can choose to move along a path toward the future we want or we can choose to leave that future up to fate and simply react to outside forces. Reason #5: Good planning provides a solid basis for our future. We’ve been reporting on the Communities in Motion 2040 scenario planning process for a year. It’s been a long process, but well worth it. Good quality planning, with input from a wide variety of individuals and interests, will provide us with a solid foundation for a bright future with a high quality of life for Treasure Valley citizens. What’s the alternative? Click here for a tongue-in-cheek look at the consequences of not planning. Click here to check out a short video for a tongue-in-cheek view of not planning. Reason #6: Do you worry about how long it will take you to get to work? Do you worry about how long it will take you to get to work? Fret over getting stuck in traffic and being late for an appointment? Instead of worrying about the problem, be part of the solution. Take matters into your own hands and help plan for your future transportation system to make it the best it can be. Reason #7: Big government projects take a long time (yes, we admit it!). Big government projects take a long time (yes, we admit it!). Planning starts now for what will happen in 25 years. Don’t wait until it’s too late to get involved! Reason #8: Can you imagine life without the Flying Wye or the Connector? Can you imagine life without the Flying Wye or the Connector? At some point, people in the past planned for them for us. It’s time to pay it forward and plan for future generations. Reason #9: If people aren't stuck in their traffic, maybe they'll stop farding in their cars! Click here to visit link. Reason #10: Unless we plan, things won’t get done by us, but they might get done to us. Unless we plan, things won’t get done by us, but they might get done to us. Is that what we want? Let’s be in charge of our own destiny. Reason #11: People always ask, “How come no one ever asks me what I think?” Well, COMPASS is asking. People always ask, “How come no one ever asks me what I think?” Well, COMPASS is asking. Reason #12: It’s about resources – what do you envision/want vs. what you might get (limited resources). It’s about resources – what do you envision/want vs. what you might get (limited resources). We need to do this for the greater good and accommodate everyone in the community (bike, skateboard, scooter). Reason #13: People tend to focus on "What's this going to cost me?" instead of "How's this going to help me?". People tend to focus on "What's this going to cost me?" instead of "How's this going to help me?" We need to change the conversation to look at the benefits, not just the costs. Presentations. COMPASS staff are available to give presentations on Communities in Motion to your group or club. Email aluft@compassidaho.org to schedule. Education Series. COMPASS brings expert speakers from around the region and the country to discuss topics related to Communities in Motion and transportation in general. Visit our public events page and click on “education series” for the current year to learn more. “Like” COMPASS on Facebook at http://www.facebook.com/COMPASSIdaho. Read the COMPASS Executive Director’s Blog at www.compassidaho.blogspot.com. View videos related to CIM 2040 at http://www.youtube.com/COMPASSIdaho. Email updates. Each quarter, COMPASS send an email update highlighting was has occurred in the past three months and what will occur in the next three months. In addition to the quarterly email updates, COMPASS also sends emails regarding other transportation-related topics. If you’d like to be added to our email list, email aluft@compassidaho.org. Updating Communities in Motion is a large task, but completing the update is really only the beginning of the process. A plan that sits on the shelf and gathers dust will not serve our valley. For the plan to truly have meaning, it must be implemented. Communities in Motion 2040 contains goals, objectives, and tasks to guide implementation, as well as performance measures and targets to gauge progress on achieving plan goals. The first projects to implement Communities in Motion 2040 began immediately upon plan adoption; additional implementation projects are continually being initiated. Current projects are highlighted on the Communities in Motion implementation page. In 2014, COMPASS initiated the Communities in Motion Implementation grant program to support COMPASS member agencies in implementing Communities in Motion, the regional long-range transportation plan for Ada and Canyon Counties. The COMPASS Board of Directors awarded three grants in FY2014, four in FY2015, five in FY2016, and three in FY2017. Learn about grant recipients and the application process here. For more information, contact Liisa Itkonen at litkonen@compassidaho.org or (208) 475-2241. COMPASS has been developing annual Change in Motion reports since CIM 2030 was first adopted in 2006. The reports evaluate factors to depict progress on meeting goals of Communities in Motion. Click here for more information and links to all Communities in Motion Change in Motion Reports.